Photos are a great way to capture small moments of your life that you want to remember for many years. Whether you are capturing your child’s first steps, your summer vacation, or a happy moment with your best friends, taking a photo is the one way that you can pause your life in that instant and save it forever. While you may take photos on a regular basis, there are some situations in which you will want to hire a professional photographer, such as with a family portrait. In today’s post, we will discuss a few reasons why you may want to hire a professional photographer to take your family portrait. At John Creighton Photography, we offer a wide variety of photography services to those in Parker and the surrounding areas, from wedding photography to senior photos and family portraits. We offer a variety of packages for you to choose from, and we will work with you to customize the package to fit your needs. Interested in hiring a professional photographer? Contact John Creighton Photography to schedule your appointment today! One of the most common reasons people choose to take a family portrait is that it can help document the growth of their children. In many cases, families will take a new family portrait each year, allowing them to see how their families grow and change. This is extremely beneficial if you start the tradition when you have young children and continue taking photos as they age into adults. Additionally, if you take family portraits year after year, you will eventually have an entire collage of photos that you can cherish and share with future generations. When you think of a family portrait, you most likely think of still shots that you take at a family reunion where everyone is lined up in a stiff pose. However, when you have your family portrait taken by a professional photographer, that isn’t necessarily the case. If you want a still shot of a stiff pose, an amateur will be able to take that photo, but a photographer is trained to capture some of the most exciting and emotional moments. For this reason, your photoshoot may consist of getting into a snowball fight or trying to make each other laugh. The photographer will work with you to capture the very best moments that will truly encompass the personality of your family. Hiring a professional to take your family portrait is not going to be an inexpensive purchase. That being said, you pay for what you get. Professional family portraits will be high-quality and capture moments that aren’t easily captured by an inexperienced photographer. In addition to the moments that are captured, the photographer will also take the time to edit and tweak the photo so that the print you receive is the best it can possibly be. Schedule a Family Portrait Today! Family portraits offer many benefits to you, your family, and future generations. 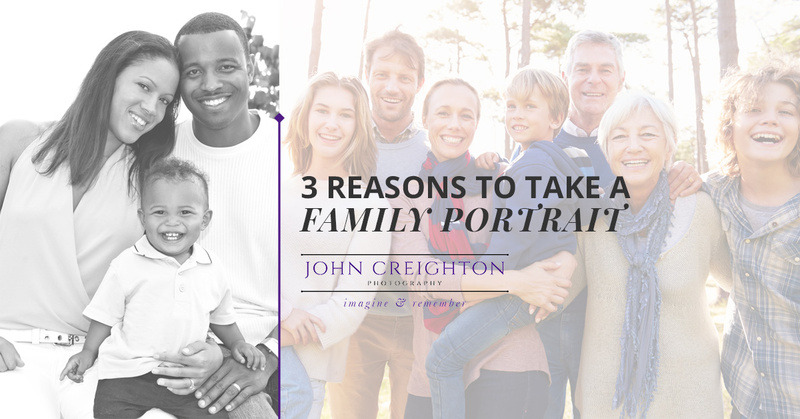 If you are interested in a high-quality family portrait that you can display and use to document the growth of your family, then John Creighton Photography can help. Our team will work with you to translate the love and personality of your family into a beautiful photograph that you will be able to cherish for years into the future. To get started, check out our family portrait packages and give us a call to schedule your appointment. We look forward to working with you and your family soon!